It’s the end of a long day, you tiredly get to your car, sit in the driver’s seat, put your key into the ignition and turn it. Instead of the comforting rumble of your car engine starting, you hear the depressing sound of a few clicks but nothing else and you mutter with irritation – your battery has died. You look around the parking lot, and thankfully, your colleague is just leaving and notices your distress. Joy, he/she has jumper cables in the boot. You align your cars to face one another, open the bonnets, and belatedly realize.. Neither of you know how to jumpstart a battery! No fear, bookmark this article, and you’ll always have a good guide! 1. 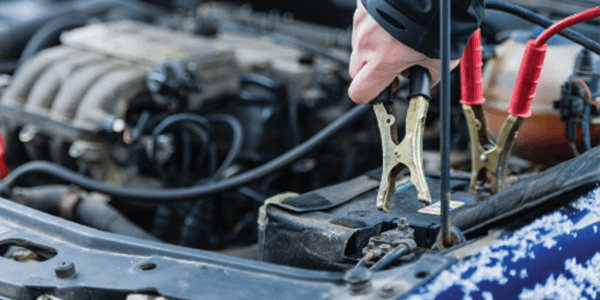 Make sure the donor vehicle’s engine is off before you connect the jumper cables as it can cause a damaging surge of current. 2. Check that your battery is in good condition. 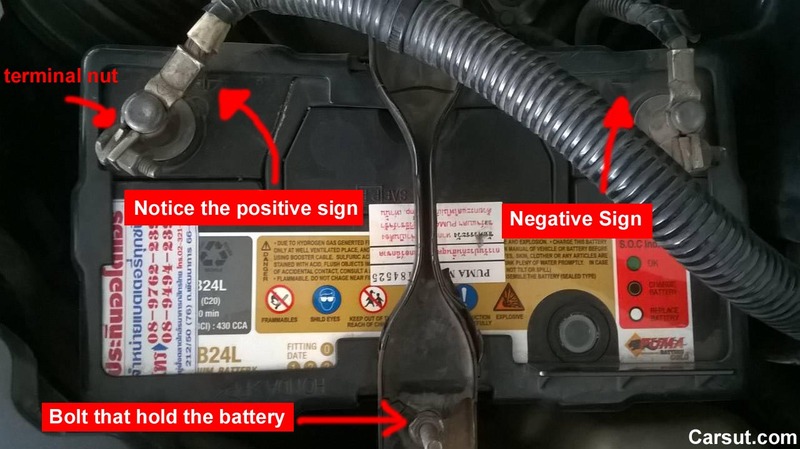 Do NOT attempt to jumpstart a damaged or leaking battery. Jumper cables come in a variety of lengths and longer cables do not necessarily mean better. 10-20 feet (3-6 meters) is a standard length. The gauge of the cable tells you the strength of the cables with the LOWER number being stronger. A 6 gauge cable should be sufficient for most cars, a 4 is preferable if you’re trying to jumpstart a truck. Don’t be deceived by the width of the cable! The gauge is what really matters. Jumper cables that have sturdy clamps with teeth are good because that decreases the changes of them slipping off the battery terminals. Rubber-coated handles decrease the chances that you’ll shock yourself accidentally. Before you begin, make sure that you battery and the person’s car you are jumpstarting from is of the same voltage. Large vehicles (we’re talking trucks, lorries, et cetera) generally have 24V batteries while most standard automobiles will have 12V batteries. NOTE 1: These are general steps to jumpstart a car. ALWAYS check your car’s manual for any additional (or different) steps needed for your specific car. NOTE 2: If either the donor or recipient vehicle has an electronic ignition system or is using an alternative fueling method, jumper cables may damage it so please make sure to read your manual. NOTE 3: Be very careful when connecting the jumper cables as leaking batteries can ignite or the process of connecting the cables can cause sparks. If you have them, gloves and safety goggles will be helpful in preventing any accidents. This is also why the connections should be made in the order described below. 1. Get both vehicles facing one another but not touching. For automatic cars, put the vehicle in Park, for manual cars, make sure your gear is in Neutral. Set the parking brake (handbrake) on both to ensure the cars don’t move accidentally. 2. Turn off both cars with the keys removed. 3. Set down the jumper cables on the ground, making sure the clamps are not touching. 4. Open the bonnets of both cars, and locate the batteries and battery terminals. Usually, the battery terminals will be covered in red or black, with a + or – sign on top (or the positive terminal will be labeled POS and might be bigger than the negative terminal. If the terminals are dirty, wipe off any corrosion with a rag. 5. Attach the other side of the RED clamp to the positive terminal of the DONOR car. 6. While at the DONOR car, connect the BLACK clamp to the negative battery terminal of the DONOR car. 7. Lastly, attach the lack BLACK clamp to an unpainted metal surface of the RECIPIENT car that IS NOT near the battery (e.g. a shiny clean nut on the engine block or a metal strut that holds the hood open). This is to ground the current appropriately. Be careful when making connections and make sure that your cables are clear of any moving parts in both engines. 8. Start the engine of the DONOR vehicle. 9. Depending on the age of the battery and how long since it has died, it might take a while. Let the engine run at least a few minutes before trying anything else. 10. Try starting the dead car. If it doesn’t start, allow the DONOR car to charge the battery for another minute or so. Sometimes, slight revving of the DONOR car’s engine while charging the battery might help. 11. Once the dead car is running, carefully disconnect the jumper cables in REVERSE order: Start by BLACK (negative) off the RECIPIENT car, BLACK (negative) off the DONOR car, RED (positive) off the DONOR car, and finally, RED (positive) off the RECIPIENT car. 12. Finally, let the RECIPIENT car continue running for another ten minutes to give the battery some charge before thanking the Good Samaritan who helped you and driving off. 13. Get your car to a mechanic as soon as possible to ensure that everything else is in order. 14. If the jumpstart fails to start the car after a few attempts, or if the car starts but dies again, there might be other issues you have to deal with. In that case, you may need to call the mechanic/tow truck to check out your car. Hopefully this article is helpful for you! Drive safely!